And when Jyothika Kumar learned about a two-month-old puppy named Ghost who was fighting for her life after being hit by a motorbike in India she vowed to help. 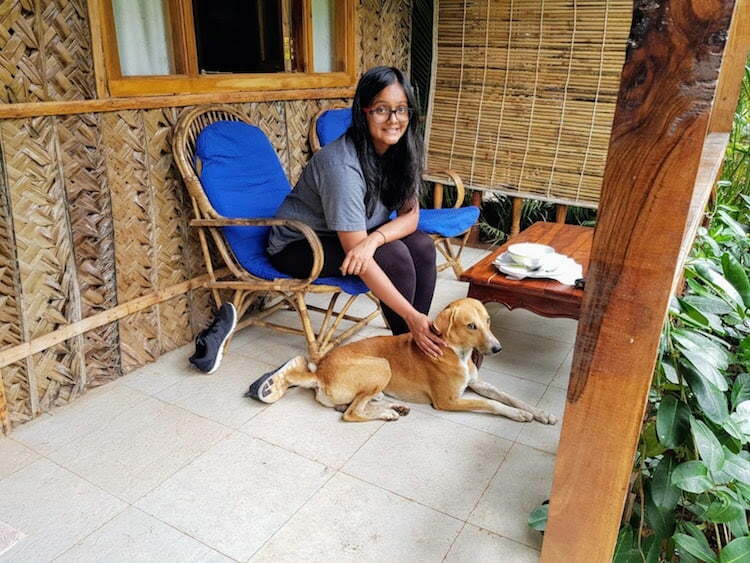 An animal lover who had volunteered helping dogs in India growing up, she decided to adopt her and she’s now crowdfunding to raise £2,250 so Ghost can fly to the UK to start a new life. Jyothika, 28, contacted me via Facebook and I was so moved by her compassion and determination to help Ghost I wanted to try to help by sharing her story. I know lots of animals in the UK and all over the world need homes, but what Jyothika and her husband Iker Perez, 31, both researchers at Nottingham University, are doing for little Ghost is extraordinary. This couldn’t be more true for Ghost and if you want to help, every donation no matter how small takes her one step closer to her new life. Simply sharing the story of their kindness on social media gives her appeal a huge boost too. 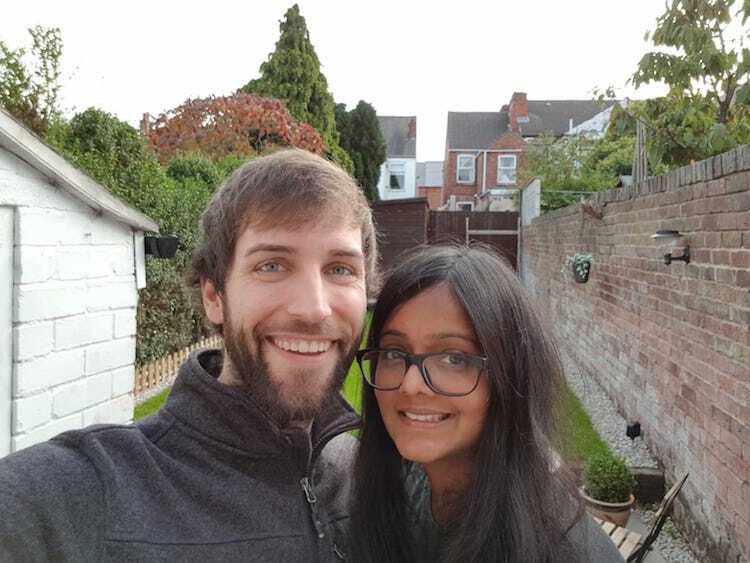 Here, Jyothika explains why she couldn't give up on Ghost and her plans to take her on an incredible journey from a little village in the Himalayas to her new home in Stapleford, Nottingham. Can you tell me a little more about Ghost and what happened to her? Ghost is an Indian stray puppy. 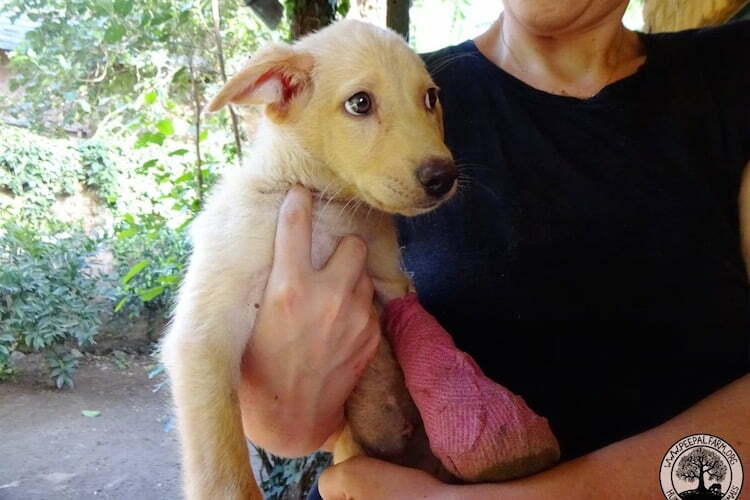 She was only two months old when she was hit by a motorbike, which left her with multiple fractures and ripped the skin off her foot. The person who hit her didn’t even stop to help. 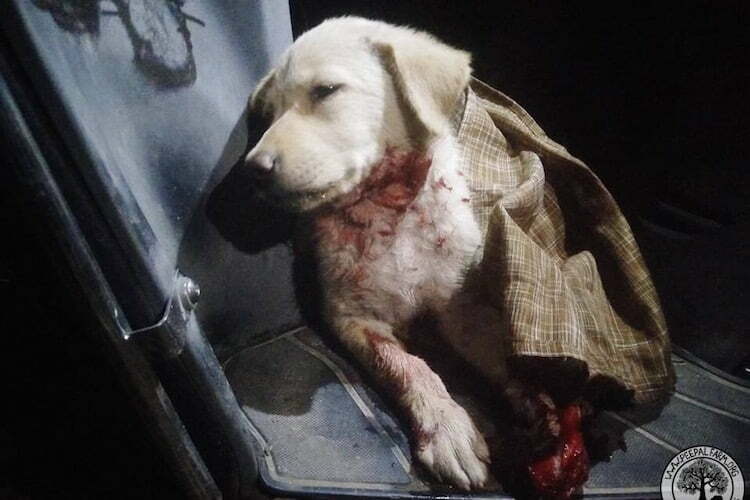 A few people passing by heard her cries and took her to Peepal Farm, an animal rescue organisation based in Dhanotu village, near Dharamsala, in the Himalayas. Although she arrived late at night, the veterinary team at the farm performed emergency treatment on her, stabilising her and suturing her wound. Without this treatment, she would have died on the streets. How did you hear about Ghost? I found out about Peepal Farm through a post on Facebook from a blog called Traveling Chapati. It’s a blog about an Indian stray puppy who was adopted by an amazing Ukranian couple while they were holidaying in India. Ghost was on their adoption page. Peepal Farm do such amazing work, they rescue and rehabilitate not just dogs, but also cats, goats and cows! They also grow their own organic produce. I've never been, but I can't wait to visit. How did you feel? And how are dogs treated in India? It made me angry. I felt sad and helpless. I follow a lot of rescue organisations and all the posts for help are heart wrenching. It’s a harsh, brutal life for most strays in India. While people aren’t necessarily always cruel to them, there is this general sense of apathy. 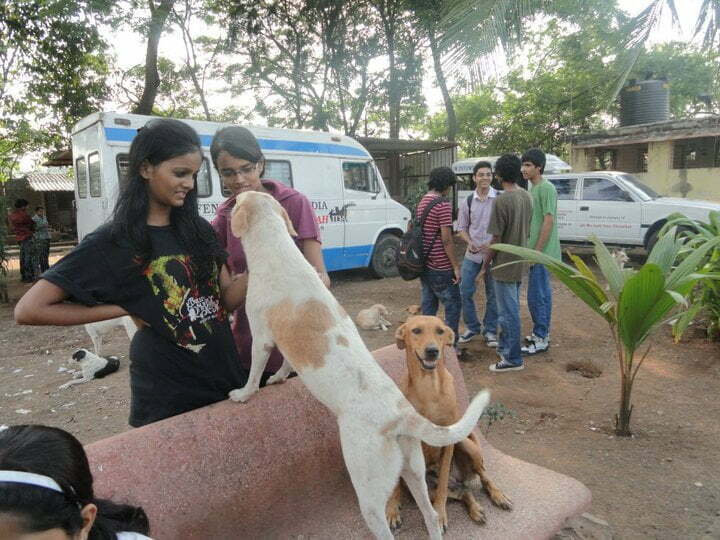 When I lived in India, I would do my best to help by volunteering at shelters, fostering, feeding dogs on the street. Now I’m in the UK, I’m no longer able to, but I donate when I can, and by sharing posts. So many animals there need help, medical treatment and homes and there just aren’t enough of us to help them. My husband Iker and I went back home recently on holiday, and we started feeding a stray puppy who looked really small and skinny. We found out that his siblings had died, most likely of starvation, it was heartbreaking. It took a week of us coaxing him to get him to come out and eat food and drink water, he was just so afraid of people! My mom is now feeding him everyday. Every time I go back, there is a similar story. But the view towards adopting strays is slowing changing, so I hope the situation will get better. Have you had dogs before? Yes, when I was in India. We had a labrador named Sweety when I was in school, she was such an angel. Then we fostered a stray puppy Mischa who was adopted by some neighbours who owned a countryside farm. And now we have Simba, also an Indie rescue who I picked up from the streets during the monsoon when he was just 3 months old. He’s now five. When I was growing up my sister and I often brought injured animals home. My parents weren’t happy at first but they always came round eventually. What made you try to adopt her? Did you considered adopting a dog from the UK? Yes, we certainly did consider adopting locally because that would have definitely been easier, especially since we have supported the Dogs Trust and other local charities. 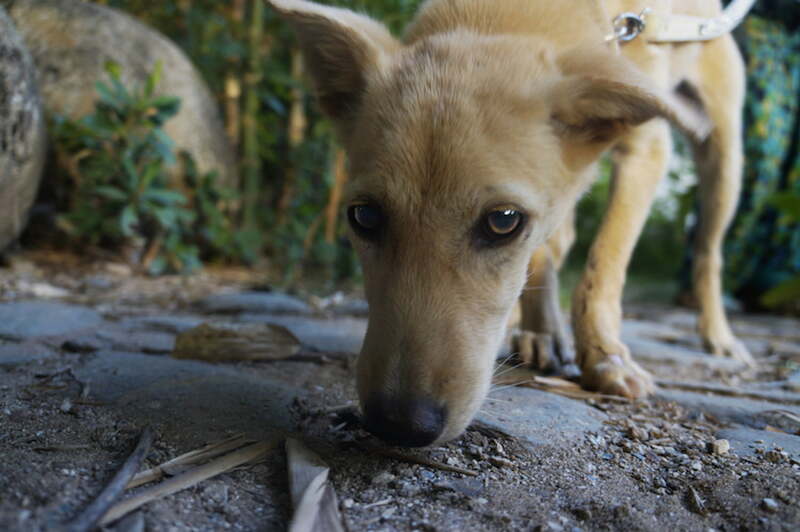 But knowing just how difficult it is for stray animals back home, and how hard rescuers work to save and better their lives, it just felt like the right thing to do. To try to do my part and make a difference, no matter how small. If people like me, who feel so strongly and who care so deeply about this don’t take such initiatives, then who will? We'd have been happy to adopt any dog, and it wasn’t easy for us to pick Ghost over the others. But hers was one of the first cases we saw, and somehow we made up our minds on that very first day. I can't explain why or how, it just happened. It sounds weird - you could call it a virtual connection of some sort - but it feels right. Once Ghost is settled, we do want to adopt another dog at some point, and we are considering an older dog from a local shelter. So Ghost will begin her journey when you reach your target? Yes, the donations will be used to cover all the costs required to bring her here. This includes microchipping, vaccinations, crate, a third country veterinary certificate (similar to a pet passport), travel costs, airport handling and animal reception centre charges. The costs are significantly higher as the law requires that pets travel to the UK as manifested cargo only, so it’s more expensive compared to flying with your pet in the cabin, or adding them to your or a flight volunteer’s ticket as excess baggage. Ghost needs a blood test to confirm that she's protected from rabies. She had her anti-rabies vaccination in early October, so she'll have her blood test in early November, as you need to wait a minimum of 30 days after the vaccination to do the test. She will only be able to fly three months after the blood test date, so we are expecting her early to mid February. It's a slow process and it's tough to wait, but we're very excited. Once she's here, what kind of life can she expect? She's part of our family already, even though we haven’t met her yet and we'll do our best to be good doggy parents. We have fairly flexible work schedules, so that will help with getting her settled in. We dog and cat sit for our friends and have always talked about what our life would be like when we adopt. Essentially she will be a part of whatever we do, from goofing around in the garden to going for hikes and walks, going to our favourite local dog friendly pubs and cafes. We also can’t wait to introduce her to Thunder (our friends’ dog) who's so friendly! What kind of reaction do you get when you tell people about what you’re doing? The reactions have been mostly positive I would say. Most of our friends and family have been incredibly supportive, even if some might secretly think that we are a bit crazy. But the people who really know me well probably aren’t surprised that I’m doing this. After all she’s been through, we want to give Ghost a second chance to have a happy life and we are so thankful of any support people are able to give. To help, visit Ghost’s crowdfunding page www.gofundme.com/fly-ghost-home. You can follow her story on www.instagram.com/flyghosthome we will be keeping in touch with her new life too. If you enjoy stories about inspiring rescue dogs, you might like to read Paula Stewart shares how her rescue dogs changed her life, or if you're interested in Street Dogs, How Jade, Sam and the StreetVet team are helping homeless dogs and owners.